Each year in November, the United Kingdom remembers the men and women who gave their lives in the two World Wars and subsequent conflicts. 11 November is known as Armistice Day, Remembrance Day or Poppy Day. From 2014 until 2018, this day takes on added significance as it marks the centenary of the First World War years. 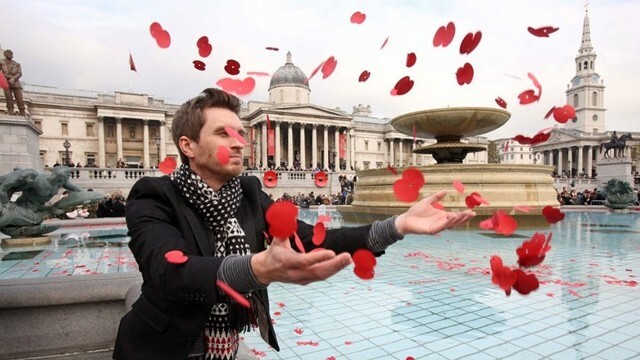 the special Silence in the Square event in Trafalgar Square led by The Royal British Legion, from 10am until 11.45am. Remembrance Sunday is the second Sunday in November, the Sunday nearest to 11 November. Remembrance Sunday sees special events and services relating to remembrance. Remembrance sunday is on 13 November in 2016. On Remembrance Sunday, there'll be a Cenotaph Parade in Whitehall. The Cenotaph ceremony is organised annually by the Department for Culture, Media and Sport, with The Royal British Legion coordinating the March Past. There'll also be various concerts, church services and events in London on and around this date to mark Remembrance Day. Ian Hunter, Fishguard / Quite simply says ," TO WEAR A POPPY is associated wityh remembrance. For me it isn’t political, it isn’t triumphalist and it isn’t necessarily patriotic. It’s simply remembering the soldiers who fought for their country and played their part, whether they came home or not. Remembrance gives those of us who wish to a chance to say thank you. Wearing the red poppy of remembrance for me is acknowledging and remembering that, without those who lost their lives in both world wars, I would not be living with the choice to wear one. My husband is a soldier and as such I am more than aware of the recent sacrifices made by our forces in Afghanistan and Iraq. However it is for the veterans of wars that I did not live through that I wear my poppy. We owe them everything we have today. People stop work to observe a moment of silence at 11am on November 11, which is the time and date when hostilities formally ended after more than four years of battle during World War I. Poppies are worn as a symbol of respect and tribute on Remembrance Sunday and/or November 11. The day is also marked by events such as memorial services, church services and parades. A national commemoration takes place at Whitehall, a road in the City of Westminster in central London.